The week was clouded with the Hurricane Katrina aftermath. Too much sorrow and anger. And just what has 4 years of Homeland Security money been spent on? Store. A national crisis on CNN is the perfect backdrop for ebay listings. By Wednesday I had up my weekly quota of 25 pieces of sheet music & 5 collectible books. Someone bought a book on the physiology of space travel. An old text from the 1960s. The guy who bought it was impressed by the bookplate -- "from the library of Wallace O Fenn." Jim undoubtedly bought the book at a discard sale way back when -- when he worked on the same corridor with the medical center physiologists. Turns out Fenn was really famous, at least among ocean and aerospace physiologists. My buyer was a physiologist working with the Navy to study the effects of deep diving on the central nervous system and lungs. Fenn was his mentor's mentor. So I get his email. I thinks it's interesting. I turn around to my pile of books and take a second glance at a small stack of boring-looking reports that Jim pulled from a corner of his office. They were all from the office of WO Fenn, dumped from his personal library when he died in 1971. 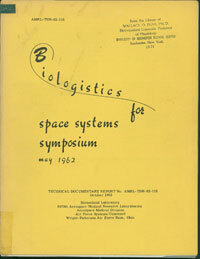 They were documents from symposia and literature reviews from around 1965 -- the very early years of manned space flight. Scientists were all debating and predicting the effects of space travel on humans or analyzing data collected by astronauts on the Gemini flights. Gosh, weren't those exciting days? So full of scientific wonder and optimism. The world was turning out to be an ugly place, with Kennedy's assassination and war percolating in southeast Asia. But our imagination soared outward. We had enough science knowledge to escape this planet and go exploring... Technology would be the answer to everything. Hmm... it's kind of a variation on that old saw "We can put a man on the moon, but we can't..." In 1965 we were orbiting the earth; in 2005 we can't get a food drop to hungry people across a few miles of hip-deep flood water. Anyway, I did my research: those throwaways (how many sets of conference proceedings did I pitch when I retired from the Institution?) that Jim picked up for 10 cents each are now selling in the rare book market for about $30 each. Not like finding a Van Gogh in your attic, but still... I guess it isn't even the money that gets to me -- it's handling a little piece of history. Fenn felt the old NASA magic and kept these in his library. Jim felt their magic too. I caught the magic for a moment and will now pass them on to a new generation.